Installation of the Terminal Server is just that easy. Just go to Add/Remove Programs, Add/Remove Windows Components and choose Terminal Server. Just follow the wizard and a sort time later you installed you MS Terminal Server. You also need to install on a arbitrarily server the Microsoft Terminal Server Licensing Server. It's advisable to install this License Server on non Terminal Server which is known within Active Directory, so the other Terminal Server automatically detect this license server. 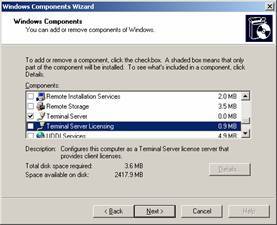 The installation of the Licensing server is also as easy as the Terminal Server itself. Just select this option, choose the locations for the database and the installation is done (after copying some files). Of course both installations can be easily build unattended (as we be used to from Microsoft) and installed via an deployment tool. After the installation of both the Terminal Server and the Terminal Server Licensing server you need to active the Licensing server and install the necessary licenses. In our Resource sections you find several websites with FAQ and guides how to deal with this Licensing server. There is true change you need this websites, because this Licensing server is not the most easy part to manage of MS Terminal Server. The configuration of each Terminal Server need to be done separately, there is no central management tool to set the configuration settings. Fortunately there are tools developed by others who can facilitate this via a central tool like the the True Control Templat of Jeroen van de Kamp. But without any tooling this is terrible job. The available options within the Terminal Services Configuration are pretty basic. 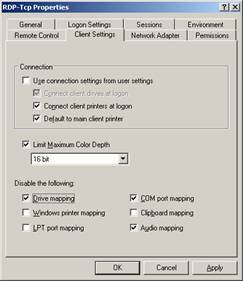 You can configure for example disconnection and idle times and client settings like drive mappings, printer mappings, audio mapping and clipboard mapping. Unfortunately Microsoft does not provide any tooling for printer (note: within SP1 a fallback printer driver is added)and software installation. Both components (together with profiles) look after the most problems in a SBC environment. For printer several products are been put on the market to solve this problems (see for this products our printing subject), but you can also make your solution (with a fixed driver set and tools like con2prt). It's advisable to use a kind of software distribution. Using a tool for distribution is the only way you can ensure you different Terminal Server are exactly configured the same. If you ever worked with a SBC environment you (should) know this is the most important rule in SBC world. MS Terminal Server relies on the NLB (Network Load Balancing) for dividing the user along the Terminal Servers. Although NLB protocol is suitable for Web servers, it's not that good for Terminal Servers. NLB does not take account of the current performance (like CPU and memory usage) and can not provide to reconnect to a disconnected session. 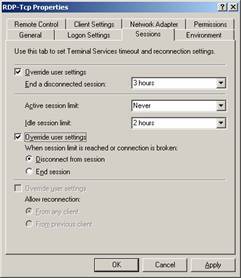 Within Windows 2003 Microsoft introduced the Session directory which makes it possible to reconnect to a disconnect session, but other products are just doing that job better. 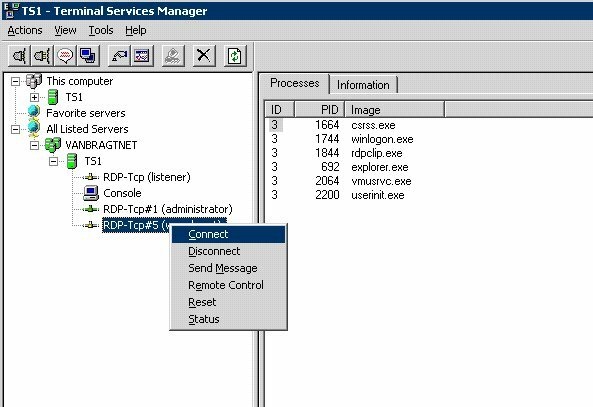 All management task are centralized in the Terminal Service Manager. All servers with Terminal Server enabled can be managed within one Terminal Services Manager (the logged in account need to have sufficient rights on the other servers). All standard tasks can be done, like Remote Control, Send Message, Disconnect and Loggoff the session. Also all processed can be viewed on a user base. These functionalities are almost the same as al other products. With Microsoft Terminal Server only a full desktop can be presented to a the end users. So Terminal Server is best useable in a 100% SBC environment, because the local desktop disappears behind the Terminal Server desktop. The RDP client is getting better and better. You can even loose temporary connection with the server, which is automatically restored by this client. Microsoft Terminal Server within Windows 2003 is awesome better than the previous versions. Only the load management module need to improved in comparison with other produts like Metaframe, Global Desktop and so on. Fortunality more and more small products are put on the market to take care of this load balancing for Microsoft Terminal Server. If you publish a full desktop to your users and find a way for the load balancing using hardware or another small (and affordable product) Microsoft Terminal Server is a really good competitor and should be set as a real alternative for the other add-on products.